According to an annual report by the Federal Bureau of Investigations (FBI), New Orleans had the highest U.S. homicide rate last year among all cities but Police Superintendent Warren Riley wants to focus on the progress that has been made and challenges the accuracy of the rankings. "We don't necessarily believe them to be accurate,” Mr. Riley said in regards to the rankings. "I think even the FBI cautions everyone against using these rankings due to the variables involved." The Crescent City had 57 homicides per 100,000 people in 2008. St. Louis has the nation's second-highest rate at nearly 47 murders per 100,000 people. The other cities that round out the top ten includes Baltimore, Birmingham, Baton Rouge, Oakland, Flint, Richmond, Calif., and Jackson, Miss. Since Hurricane Katrina struck in 2005, there has been an on-going disagreement over the exact number of people presently residing in the city. The FBI last reported in July 2008 that there were a little over 281,000 while the U.S. Census Bureau reported that the population exceeded 311,000 and the Greater New Orleans Community Data Center put the city’s population at over 324,000. “Crime has always been a challenge for us in the city of New Orleans. It's a historic thing that dates back, you know, 20, 30 years ago”, said Mayor Ray Nagin in an interview with an Australian radio show during his recent visit to Sydney University. 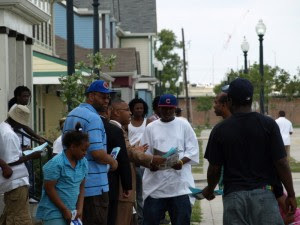 NOI Student Minister Willie Muhammad, since February, has been closely working with a diverse group of men who are walking through some of the most violent neighborhoods of New Orleans every Saturday for one hour. The initiative is called the Peace Keepers 1 Hour of Power and is aimed at providing services instead of condemning the young people in the streets. Reverend John Raphael of New Hope Baptist Church created the Yes We Care Movement as a means to show the collectively disgust and dissatisfaction that the Black community has with the violence that has taken the lives of many youth in the first half of this year. Both religious leaders agreed that something needed to be done to intensify the involvement of Black men in the community before the beginning of what could be a potentially violent summer. So they united their efforts.